The nice thing about having elderly parents is that they sometimes let you root through their stuff and let you have the things they no longer use. 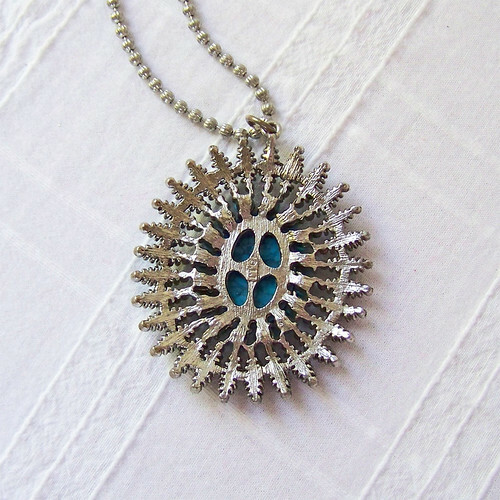 I've come across some amazing finds that way - like this wonderful turquoise and silver necklace! Neither my mom nor I clearly remember exactly where this necklace came from. I have a vague memory that we got it at a flea market when I was just a little girl. I remember that I was attracted to the colors. I am not certain if the turquoise on the pendant is real or not, but it's finely detailed. The pendant is almost 2 1/2 inches (6.4 cm) long by 2 inches (5 cm) wide. Both the pendant and the 20 inch (50.8 cm) chain are finished in an antiqued silver style. Like it? Please check out my profile for more info!